Barefoot In Blue Jeans: This past week, last weekend. This past week, last weekend. SO sorry! 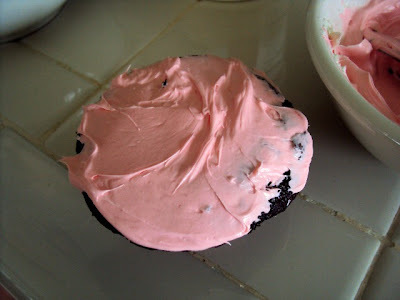 I have been so busy with homework and such that I haven't had time to post :( I thought I was going to be able to keep up this blog. 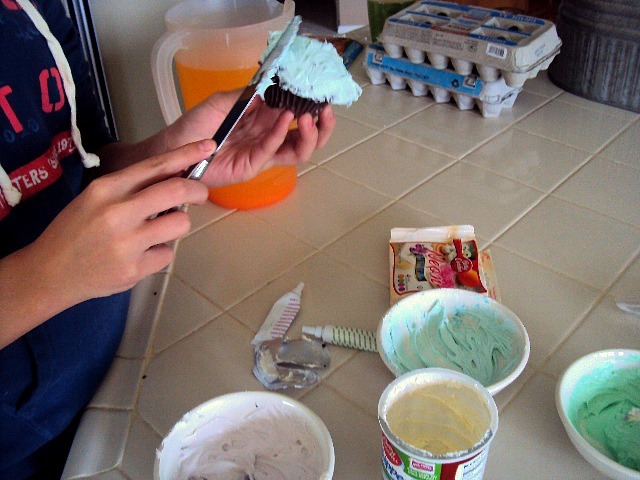 Today, I'm going to post some pictures from last weekend, of my friend Kenzie and I, decorating the retarded cupcakes. I made cupcakes on Saturday and over filled the cupcake liners, and so the cupcakes started lopping over the sides.... they were a bit difficult to decorate, but we made it work. I love going over to her house because it's in the country and her house is always decorated like the kind of 'country' house I want to have someday. We also went and saw Abduction on Saturday night. There was this cute lady there and she said she was in her 80's, my jaw dropped, I thought she was 50 something. She did not look 80. We got to talking about how this day and age, a lot of the kids are disrespectful to their parents and elders and Kenzie and I agreed, It wasn't good. This lady said that she worked her son from early in the morning, or when he got home from school till like 9'o clock at night and all he wanted to do was go to sleep. This lady also worked with a special needs girl, and I thought that was really cool! She has already graduated high school and all she can read is at a 2nd grade level. :(. I couldn't believe it. This special needs girl was adopted at age three by a rich family, who chose not to start tutoring her then... and this girl has a lot of adopted brothers and sisters, they even admit it that they are just free farm labor. I wanted to cry! The poor girl's parents keep putting extravagant ideas in her head, that she can become anything she wants to be! Not really, not at a 2nd grade reading level... after graduating high school. I love how this 'old' lady works with this girl. Anyway, the movie was good, Taylor Lautner was ok, I guess. They could have picked a better actor to play Nathan. This movie is about a teenager (Nathan) who is partnered up with a girl (Karen) and they have a bit of history. They are in a Sociology class together and they have to do a report, they choose Missing Children (I guess) and they start researching on missing children's websites, well Nathan finds a picture of himself on there and you'll have to find out the rest for yourself. It's pretty heart racing. When we got back to Kenzie's, we watched more movies! P.S. I Love You (Click link for small summary), and I watched The Notebook for the first time! Oh! That movie is such an awesome movie! I love Rachel McAdams, and James Garner and Ryan Gosling! Haha. All very very good actors. Here are the retarded, but so yummy, cupcakes! I used cream cheese frosting, which made me love Butter Cream forever! 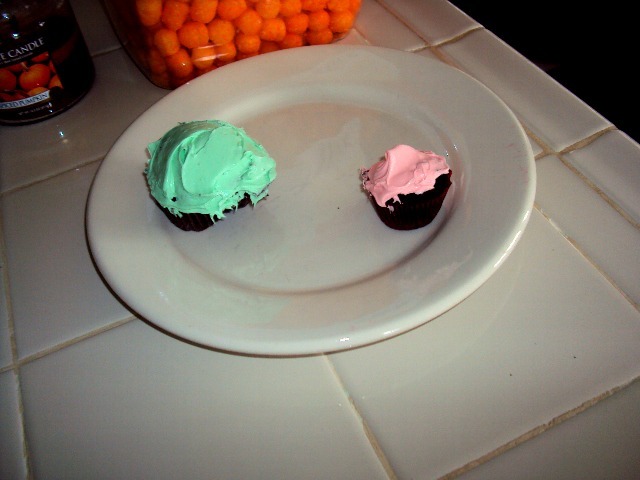 I don't really like the cream cheese. 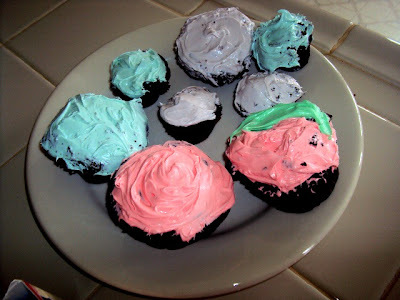 I used the same recipe as in the post:Chocolate Cup Cakes. 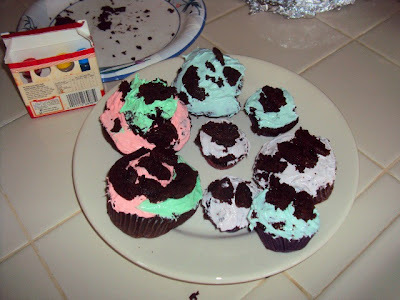 We took the edges that lopped over the sides, and we decorated the cupcakes with the edge pieces. It was a really fun time! 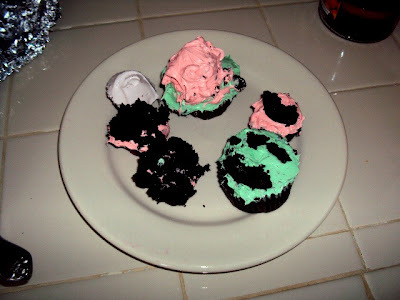 Next time, the cupcakes will be better made.